New for 2019, Lavazza have changed their bag design to stylish deep blue and gold - look out for updates on all the Lavazza range as stocks come in. Lavazza, the Italian Coffee Specialist, selects the finest quality beans at their source in exotic locations around the world and then prepares premium coffee blends that are ideal for use in professional espresso machines. This attention to detail is the secret behind Lavazzas guarantee of consisten in-cup excellence. Espresso Super Crema Coffee beans / Cafe en Grains Net Wt 2.2lb Poids Net 1000g per bag. Six bags per box. 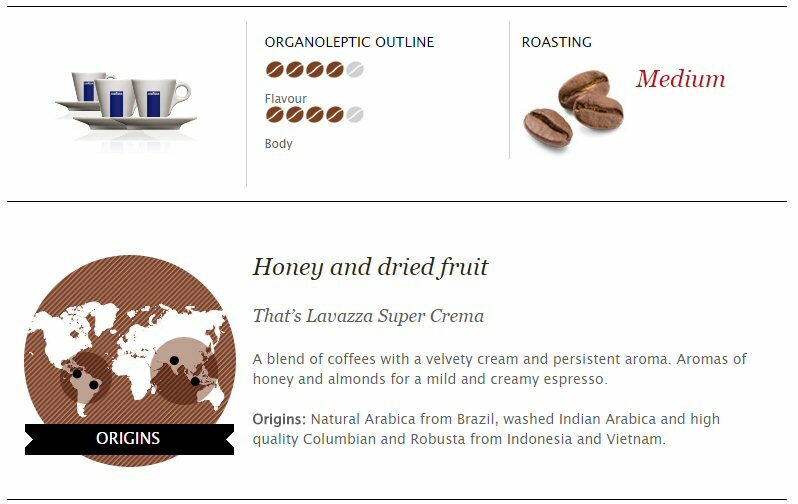 A velvety-cream coffee blend with aromas of honey and almonds, for a sweet, creamy espresso. It is born from the union of Brazilian, Indian and Colombian Arabica with Robusta from Indonesia and Vietnam.